Abdelbaki’s work emerges in the context of the ongoing Syrian war and the underlying social crises currently being experienced by the citizens of the Middle East. Abdelbaki’s large and mid-sized canvases present rich allegorical studies of human relationships using stark abstracted figures and bold colors in evocative domestic tableaux. 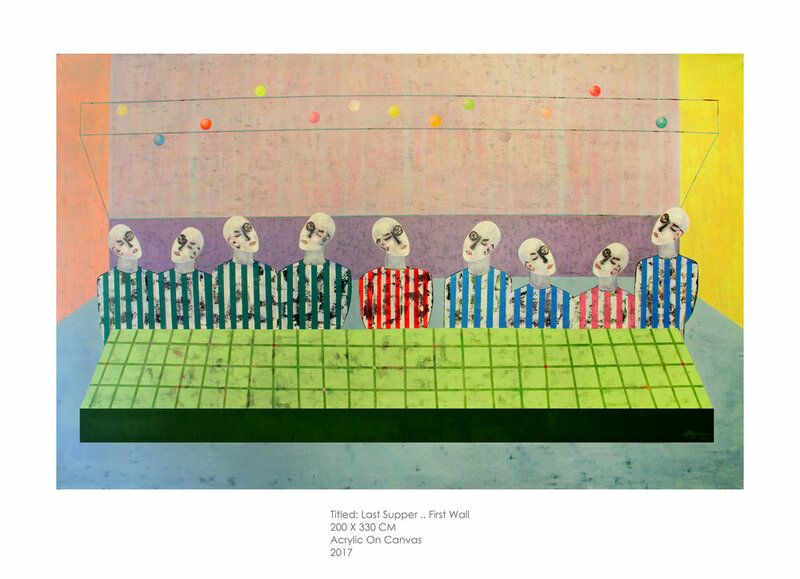 A recurring motif in Abdelbaki’s paintings are figures clothed in simple striped garments and depicted with one eye open and the other eye closed. The artist says of these figures, “in these faces is the fear that keeps us from sleeping in peace, always vigilant so that we can know what’s happening around us and be prepared. The people of this piece are striped to show how politics and religion constantly strive to group and imprison us: to have us think that we are all different, to divide us according to belief and nationality and color.” Rashwan Abdelbaki is an emerging Syrian artist born in 1984 in Damascus, Syria 1984. He graduated from Fine Arts College of Damascus University in 2007. He has had solo exhibitions at Dar Al-Mussawir in Beirut and the Al-Hamra Theatre in Damascus and has received fellowships from the American Academy in Rome, the Institute of International Education’s Artist Protection Fund, and the Vermont Studio Center.